It seems that nearly everyone in the Sanata 22 class took my advice on how to avoid mast losses. i know because over the last few years I have hardly built any Santana rigs! I have a fair bit of experience with Santana 22s. 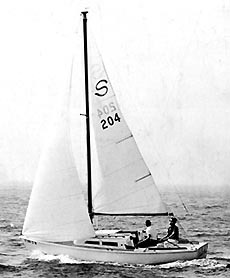 Since 1974, I have built over 80 Santana 22 masts! I have specialized in them for 20 years now, and have built more masts and booms, and have more Santana parts available than the factory or anyone else. The holes for the turnbuckle pins in the standard aluminum chainplates tend to elongate and corrode over the years. The best thing to do is to saw the chainplate off at the bottom of the original holes and drill new holes with approximately 1/2" of metal above the new holes (make sure that the lower turnbuckle jaw has enough room to move freely). Also, switching to heavier turnbuckles with 5/16" pins instead of the original 1/4" pins helps the situation alot. All Santana 22 standing rigging is made out of 5/32" wire. This wire size is adequate on the headstay, backstay and upper stays. It is not adequate on the lower stay. The single lower stay is quite heavily loaded because the chainplates are so close to the mast on the cabin top, so the lead angle is quite narrow. Also, the lower stay supports the spreader. Because of these two factors the lower stay is considerably more loaded than any of the other stays on the boat, and needs to be upgraded to 3/16 wire. All turnbuckles on Santana 22s should be upgraded from the standard 1/4" threaded shanks and pins to 5/16" threaded shanks and pins or turnbuckles strong enough for 3/16" wire (even on the 5/32" wire). As Santana 22s age it is very important (even with the rigging upgrades mentioned) to replace the standing rigging on a regular basis. I strongly recommend that the stays be replaced after six or seven racing seasons (or eight to ten years) to avoid stay failure (and mast failure). Boat insurance is about the only bargain left in insurance these days. To fully insure a Santana for $5000 costs about $170 a year. It is very important to have insurance because a mast replacement or minor fiberglass damage due to a collision can easily run $3000 or more. If all of the preceeding advice is followed, I'm sure that mast failures will be kept to a minimum, and that if a mishap does occur, you'll be able to get it fixed. If you have any questions, please give me a call at 510-521-7730.